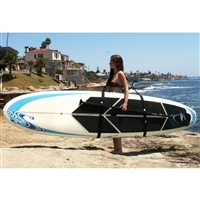 Our trailers and carriers are designed by people who know what it's like to struggle to get a long and cumbersome SUP board to the bay, lake, river or ocean. Wheeleez makes exclusive balloon wheels especially for going across sand with ease. The Mule and Wheele Boardwalk allow pulling your board(s) on a wheeled trailer by hand or you can attach it to a bike (requires an upgrade in the Wheele model). 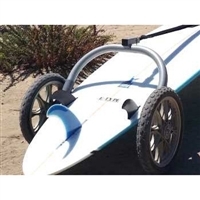 With plenty of bike trailer models as well as carts that fit not only SUP boards but Kayaks, you are sure to find the trailer that works best for you here!